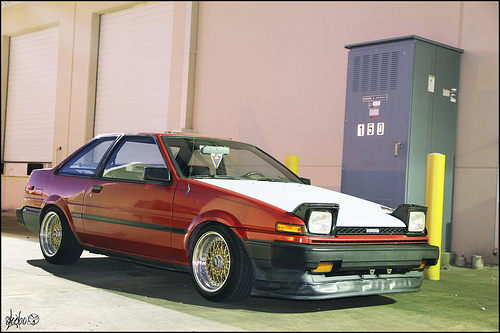 This red AE86 Toyota Corolla is lowered on a thick set of BBS RS wheels. The wheels feature gold faces with wide polished lips. They also have BBS RS full height center caps. This entry was posted in Toyota and tagged 15" BBS RS, 15x8.5 BBS RS, AE86 Corolla, BBS RS, Gold BBS RS, Toyota Corolla by admin. Bookmark the permalink.